The Greek Orthodox Easter is a time for celebrations and festivities that surpass even the most lavish of Christmas revelry anywhere in the world. The Greek Orthodox Easter is calculated using a different calendar to the Catholic Church and the two can be up to five weeks apart. Greek families travel from all over the world to get together in their home villages in an incredible atmosphere with fireworks and feasting. 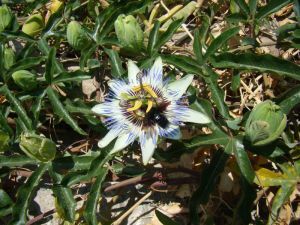 Some of the islands, particularly Amorgos are inconceivably special at this time of year because of the traditional way of life and all the spring flowers are at their very best. The flowers and herbs carpet the hillsides in a spectacular show of colour. Some islands are quieter than others, some are almost impossible to get to and on other more traditional and remote ones such as Amorgos the islanders get completely carried away and throw fire crackers and even sticks of dynamite to punctuate the activities. The island has three distinct communities that are all brought into the festivities. 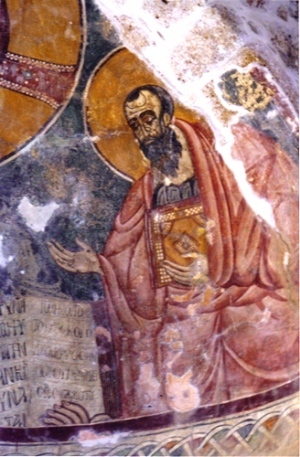 Three invaluable and treasured gold Byzantine icons are kept in the main monastery of Hozoviotissa. At the beginning of Holy week a priest will lead a procession with one of these icons to each district. 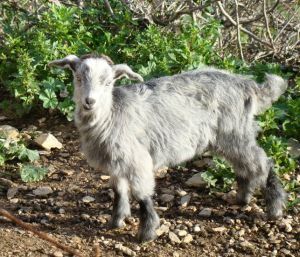 Unlike many places in Greece where this transfer is done by road, on Amorgos they parade for hours through the mountains, on the old donkey tracks, accompanied by the islanders on donkeys singing and playing traditional instruments as they proceed. Many remote villages are included in the tour and services are held in all the main churches and many small chapels on route. During Holy week devout Greek Orthodox will fast and will only eat ‘fasting food’. This excludes meat, fish and olive oil, but shellfish, octopus and lobster is allowed so life isn’t exactly unbearable! The sombre mood of the week intensifies as Saturday approaches. On Good Friday at sunset a service is held in each of the large village churches. Half way through the service the congregation come out of church and a procession goes around the village led by the priest and the villagers carrying a bier on which there is an effigy of Christ. When they get back to the church the bier is held up high and everyone processes underneath it back into church for the second half of the service. At sunset on Easter Saturday the villagers start to gather in the square and at the tavernas and the atmosphere is electric. This is the build up to the biggest time of the year for everyone. Just before midnight everyone files into the church and the liturgy begins. At midnight it reaches its climax with the words ‘Christ is risen’ the sombre mood of the past week is shattered by peals of bells and exploding fireworks. Everyone in the congregation and people in the street will turn to each other and say ‘He is truly risen’. This answer and response will be heard many times as people greet each other over the following week. The service continues for a little while after Midnight. 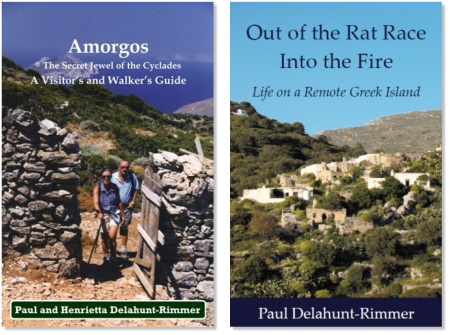 However on one occasion a few years ago, on Amorgos, it came to an abrupt end when the whole village had to rush out of church to extinguish a bush fire started by a slightly over enthusiastic young man throwing sticks of dynamite. If everything goes according to plan the congregation and priest gather outside the church after the service and the church doors are closed. The priest holds a candle with the ‘holy flame’ and calls for all the evil spirits to leave the church. Theoretically the doors of the church should miraculously fly open and the evil spirits disperse. In practice someone is left inside to perform this task. Two years ago on Amorgos when the priest performed this ceremony the ‘trusted’ insider, as a joke, didn’t open the doors. The priest thinking that he may not have heard shouted the prayers louder and louder until he was blue in the face and, much to the amusement of the crowd, getting extremely annoyed. Needless to say he has not been caught out again, yet. 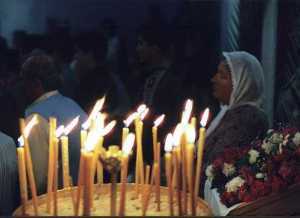 The crowd light their candles from the priest’s ‘holy flame’ until the whole square is illuminated with flickering light. If people can get back home without their flame going out it is said they will have a good year. On returning home early Easter Sunday many people break their fast with the soup made from the goats entrails and some even go on to have their main Easter feast. In Amorgos the islanders are renowned throughout the Cyclades for their ability to party for days and in some villages the music and dancing goes on all night. Different islands and different villages have various traditions over the next two days. One village in Amorgos, close to the hotel, on Easter Sunday afternoon has various games and dancing in the square. It is quite common for some of the elderly men to forget their age and play leapfrog and do some wild dancing with people a quarter of their age. It is also therefore quite common for the doctor to be called the following day when they can’t get out of bed. Close by the hotel on Easter Monday afternoon the villagers sit an effigy of Pontius Pilot on a wall and blast it to pieces with shotguns. The celebrations tailor off after this but continue to a small degree for the next forty days. A week after Easter the icons lent to the three parishes are taken in a procession, through the mountains, back to the Hozoviotissa monastery.